My goodness! I must say the 1st of the month seems to sneak up on me! I am just putting the finishing stitches on the fifth block of Sue Garman’s “Bed of Roses”, a BOM I started back in April. I love this quilt because the blocks are actually easy (oh yes they are!) but the blocks don’t look easy. I hope that makes sense! Ok, so first I traced the block onto the background with a Clover water soluble marker. Notice, I don’t trace what is inside the shapes, for example, the big flower. The reason I don’t do this is because once the prepped piece has been glued in place, it covers up all the inside markings and then you can’t see them. Next, I added all the bias strips. I use a Clover 1/4″ bias maker to do all of my stems. I glued them in place and then I stitched them before I added any more pieces. …and then I place the template shiny side up on the prepped piece and mark any remaining seam allowances. It makes lining up multiple pieces soooo easy. Trust me! Next, I prepped the big flower that sits right in the middle of the block. Notice the marked seam allowances? Now I know exactly where the next pieces go. Easy Peasy! I prepped a bunch of the yellow doo-dads and glued them in place. I even marked the seam allowances on them! Now I placed the green pieces in place. See what I mean about being an easy block? So, now I added the tiny leaves and four smaller posies. Now it’s time to add some circles…. Lots and lots of circles! And, to top it all off, a sparkly little vase. I am giddy with excitement! Here are all 5 blocks so far. All these blocks are available on my website Simple Bird Studio. 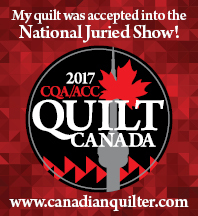 Last weekend was the quilt show at the Simcoe County Museum. Ruth, from Stitiching Impressions, kindly displayed my “Friends of Baltimore” quilt at her booth. My friend Kathy and I go to the show every year. Not only do we love to see the awesome quilts, we love to have a piece of Sugar Pie! Of course, we did a bit of shopping at the Merchant Mall. New fabric and pie….does it get any better? What else am I working on? Oddly enough, I am enjoying sitting at my sewing machine working on a scrappy quilt called Trail Mix, designed by Edyta Sitar of Laundry Basket Quilts. So much fun! « Bed of Roses Block 4 – Part 2 and Some More Baltimore Pics! Thanks for sharing. The Bed of Roses quilt does look easy with your method! Great job! Again another beautiful block. Thanks for sharing. Thank you. Everything is beautiful. I m also doing the Trail mix pattern. Just gathered all the fabrics. Thanks! I am loving the Trail Mix pattern. A good chance to use up all those scraps!! Another beautiful block! I have 3 complete and started on number 4, 5 is on order!! The border method was really great too, thank you! You’re so inspirational!! Hi Ellen: So glad to hear you are keeping up with the blocks! I too thought the borders method was pretty slick! !